This one is a mystery. The mystery is not in the garment, a completely unremarkable one piece slip (note the hip gathers so common in the late 1920's) but in the brand. 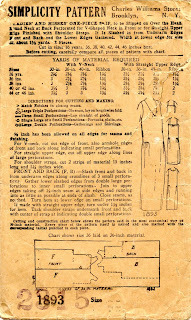 The Simplicity Pattern Company that we know was founded in 1927 by James J. Shapiro and his father. The New York Times obituary for Mr. Shapiro gives a good summary of the company and its founding philosophy. But this Simplicity Pattern was put out by the Charles Williams Stores, a mail order house established in New York City in 1913. An announcement of their incorporation at the time stated that Charles Williams Stores will "carry practically every line of merchandise, with the exception of automobiles and undertakers' supplies." Late in 1929 the company was acquired by National Bellas Hess, another mail order house. How curious. It's possible that Charles Williams Stores was in financial trouble by 1927 and was only too happy to sell the Simplicity name to Shapiro - or perhaps the line was never a strong seller for the mail order house. It seems unlikely to me that Shapiro, also doing business in New York City, was unaware of the existing Simplicity pattern line. Shapiro's timing couldn't have been better, and I'll have more to say about this when I profile some early Simplicity patterns.